It is summertime and amateur theatres such as the Teatro Povero of Monticchiello or the Bruscello of Montepulciano spring up all around Tuscany. 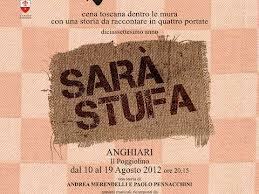 In Anghiari, a small village not far from Arezzo, one of the nicest Tuscan popular theatre company called “Tovaglia a Quadri” (checked tablecloth) is staging for nine days up to August 19th 2012, a piece called ”Sarà stufa” (it is going to be in need of a stove). The adventure of the company started 17 years ago and since then it has always kept faithful to its popular and convivial features of a symbolic though realistic dinner table-stage. 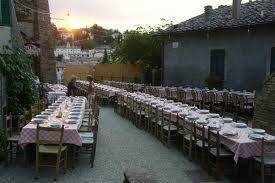 The Poggiolino, the main square of the town, is the customary site of the performances which focus around a long dinner table, typical of the Tuscan countryside tavern. Among medieval atmospheres and white-red checked tablecloths past, heritage and intertwined contemporary issues shape up into amazing performances. The audience, sitting at the table on a four- course dinner of local specialities is silently involved in sharing the physical space generally allotted to actors. Audience and actors are spatially joined in stories dealing with memories that, though local, are plugged into a wider historical macrocosm. The performance “Sarà stufa”, directed by Andrea Merendelli and Paolo Pennacchini has a quite simple plot. A tinker is going to repair an old stove which has been stored in a basement for fifty years. Core of an after war background family, it stands as symbol of family reunions in the cold winter days. To it plenty types of hands approached in search of warmth, food and cherished memories. Hands worn out by toil, hands corrupted by gambling or stingy ones forced by poverty to hold on tightly to the few left coins in the pocket. The stove has, in a way, become the silent witness of silent stories told by hands looking for shelter under its precious heat. So blessed in misery the stove was unjustly forgotten in wealthy periods. But, now, it is not going to be scrapped, its role is starting to be again revalued because of the contemporary crisis. The difficult economic situation, the old- new enemy is knocking at the door, making of the stove a totem against uncertainty and future plans. How does the small community react against this crisis? Passive acceptance of the events or reaction against new invaders able to subdue and control? 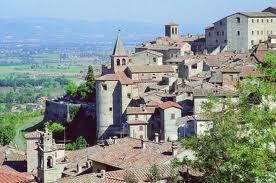 The inhabitants of Anghiari are accustomed to oppose resistance. It belongs to their historical heritage, they know this well-trodden path. An open debate starts, followed by a revolt lead by the hostess. The self- sufficient community is going to rely just on its hands able to produce. The term consumption is being questioned and the issue debated as in wartime. The cherished memories of a past world, made up of charcoal pits and coal cellars are coming to surface as well as the iron mines of the ancient forefathers the Etruscans, swept away by the industrial society. 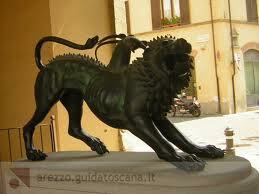 The future is a Chimera. The reference to the classical myth, as a monster defeated by a brave warrior is evident and under the surface the Chimera, the Etruscan masterpiece found out in the outskirts of Arezzo in the 16th century, restored by Cellini is still present as a steady memento of the glorious past. 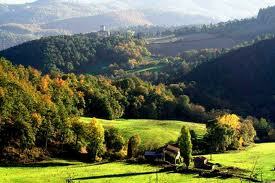 If you are thinking of an escapade, profit from the accommodations on site offered by Tuscany Holiday Rent. Questa voce è stata pubblicata in Culture and accommodations in Tuscany. Contrassegna il permalink.